Whether commuting the streets of Canadian cities or cruising country lanes, this is the complete package — all for a reasonable price. The City Commuter was built with your comfort in mind. From its quick-release handlebar stem, to its deluxe saddle on a suspension seat for extra cushioning where it counts, it provides a smooth and comfortable ride. What really sets the City Commuter apart is its supercharged performance. It’s recognized worldwide as one of the most powerful electric bikes on the market, and it’s just plain fun and exciting to ride. A lightweight, long lasting lithium battery with an industry-leading two year limited warranty. It is smaller than a pannier bag and takes you up to 100 kilometres on 10 cents of electricity. The 500 watt geared motor delivers best in class acceleration and hill climbing, while barely making a noise. It is strong and reliable. They are simply the most pleasurable. My Pedego’s name is Hope and she is helping me rebuild my life by rebuilding my body. I bought Hope right before my gastric sleeve surgery and she supports me with PAS and her throttle to build muscles in my legs and hips making me feel terrific and giving me energy to be more active. My favorite characteristic of Hope is her battery life, her power, and her ease of use. She is consistent, easy to learn, and she builds my confidence everyday. Yesterday I stopped into my Pedego Dealer in Glendale AZ and Steve hooked Hope and I up with a bike rack so Hope and I can go exploring! The bike is fabulous and my dealer is an Angel. I feel in control, and adventurous! My Pedego City Commuter is everything I hoped it woukd be. Purchased in Juno Beach Fl. Thank you Lisa and Michael for great customer service and technical support. October 2017 I visited Pedego Portland for the first time and was greeted by Tommy and his staff. I was impressed with their knowledge and Tommy’s genuine character. Although I wasn’t planning on a purchase that day, I left purchasing the City Commuter. I couldn’t be happier with the bike that was meant for me. Truly GREAT FUN and quality. I bought my City Commuter as a birthday present for myself. At 71 It is everything I thought it would be and more. I don’t spend less than an hour on it at a time and sometimes two. I now get the exercise I wasn’t getting because of Arthritis in my ankles. I upgraded to the large battery and I can go from here to the moon. After one month I have almost 400 mi. on it. I only wish I lived in a state that I could ride all year long. If you are reading these reviews I’m sure you are close to buying a Pedego bike. My wife and I saved our money and finally purchased our City Commuter’s on November 21, 2016. The bikes are high quality from ground up, they have the fenders, great brakes, great suspension, front and rear lights and a comfortable seat. We are 65 years old and we just needed some help climbing hills so we could enjoying more miles. I hope you find yours soon. I bought my Pedego City Commuter (metal blue) bike after researching electric bikes on the internet. When I went to the store, I was greeted by the owner (Howard Ickes) of the Henderson Nevada store. He explained EVERYTHING about the bike to me. I took a couple of them out for test rides before choosing the City commuter. Theresa organized the paper work and delivery setup for me. About a week later, the bike was delivered to my front door step by Anthony. Excellent customer experience from Howard, Theresa and Anthony, from the Pedego Henderson team, all the way through. City Commuter a great bike ! ! I bought the City Commuter yesterday – in Michigan and having great late fall weather so I pushed it hard. The 48 volt 10 amp bike has great torque and today I did 22 miles – much of it in 4 (out of five) due to strong winds — lots of juice left. I am 68 – very active – but this will let me go on 35 mile trips instead of 20 mile trips – I love it. Compared to Trek dual sport + and Raleigh this is a much better bike for me. Ride comfort, throttle at start ups (in 6th gear) and quality all make this a winner. After sharing the City Commuter with my son for 2 months, we just purchased our second so my wife and i can ride on the weekends. We use them to tour around our suburban/rural area on the weekends. So much fun. Last May I purchased a City Commuter as an alternate to driving to work. This bike has been used almost daily since that time without a hitch. Unfortunately in December it developed a crack in the frame by the battery support. After answering a few questions and taking a few pictures I received a completely new bike minus the battery and seat. This company definitely over delivers! I was expecting nothing back except a new frame. Big props to our local rep at Scooter Pro and the customer service team at Pedego! The service could not have been better Julie & Ruby were really knowledgeable on all aspects of the Pedego bikes. I am really impressed with the quality and performance of the bike. Pedego's customer service is amazing! My partner and I both have Pedego City Commuter bikes. They both have in excess of 1000 miles on them, and are approximately one year old. The bikes are not only a total blast to ride, but Pedego stands by their product better than any company I have ever dealt with. They replaced my entire shift mechanism for free, and upgraded it to a newer shift system. When our batteries started losing capacity they sold us greatly discounted batteries even though our bikes were no longer under warranty. All of their advice, assistance, and replacements are provided with a genuine smile and a true willingness to help. I will be true to Pedego in the future due to this exemplary service. Thanks, Pedego peeps! 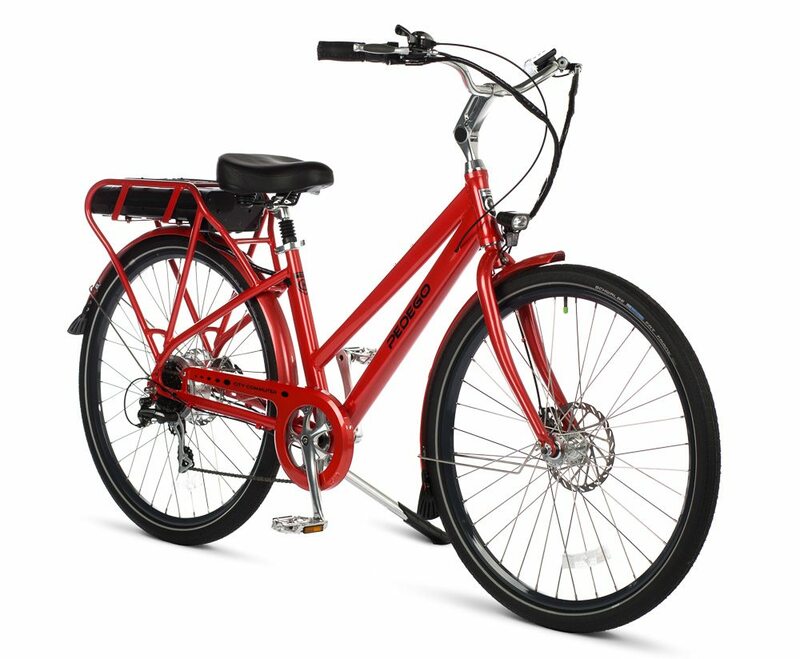 Purchased the Pedego 48V 15AH 28″ City Commuter late November, 2014. The bicycle needs a few refinements, but have been extremely happy with my purchase. Front light could be better. I have a few items that needed tweaking, but when contacted customer service, action and service was swift. Example was instructions and recommendations for removal of rear wheel for tire/tube replacement. I am expecting to put 2k miles on my commute and lunchtime adventures. Saves my sanity from Silicon Valley traffic. Nick in service was over the top! i have never received this level of warrantee service on any product I have ever purchased, and I am 70 years old. The kicker here is that my Pedego City Commuter is out of warranty, and Nick told me what was wrong with the bike over the phone, sent me the parts no charge and I was able to repair it myself and I’m now back on the road enjoying my Pedego which now has nearly 2000 miles on the odometer. Thanks, Nick and thanks Pedego! I purchased a Pedego City Commuter ebike about one year ago. I could not be any happier both with the quality of the product and the levels of customer care these folks give to their bike owners. Would not consider buying a different brand and my wife is looking at going over to. Pedego as well. Nice job you are doing with the company as well as your franchisees. My wife has had her new Commuter bike about 2 weeks now and she loves it. Excellent quality and well thought out design. Our local dealer was great and a pleasure to do business with. Looking forward to getting me one soon. Yes, it is good to have fun again. Total satisfaction with bikes and dealer! Mary and I visited Mike of Pedego of Sarasota while on vacation last year while in Florida. I had done my research on several mfgrs. of electric bikes and decided on 2 Pedego City Commuters. Mike priced them for me along with the accessories Pedego was including at the time. I was not ready to buy yet. One year later we went to San Francisco and took a 6 hr guided E-bike tour from Dylan’s Tours of S.F. We rode the Pedego Interceptor – step thru. One week later, after an absolutely marvelous tour and bike ride I called Mike again. He looked up my previous order, remembered who we were, changed the order to Interceptors and honored the pricing previously given! The bikes were ordered, the accessories (also changed to new basket and Basil XL Panniers) were also ordered. All arrived within 10 days in 3 separate orders: basket then panniers then bikes. During this this time, Mike answered every email I sent and and kept me informed of the progress. This is the only time in my buying experience I wish I could give more than 5 stars! Great job Mike, and fantastic bikes Pedego! My wife and I both purchased a City Commuter 48V bike a little over a year ago. The area that we live in has a lot of mountains and trying to get home after a long bike ride was no longer fun. With these new bikes we can ride until we are tired and still enjoy the ride home. We recently got new batteries in the recall but my wife’s battery was DOA. I called support and was helped by Casey. He had me run a few tests on the battery and then walked me through fixing it. Casey was everything CUSTOMER SERVICE is supposed to be. I bought the City Commuter last year, I’m very happy with my City Commuter, I use to go to my office 15 kms far away at least 2 times a week and I use in my neighborhood every weekend , many hills around my house and is fantastic, I really recommend the City Commuter. I have had my 28″ Commuter and have been using it as my , good weather, transportation to and from work for over two years. It has been a JOY to ride. The equipment is top notch. I bought a second Pedego Comfort for my wife and have been able to enjoy longer rides together. The Classic City Commuter is perfect! I have been thinking about ways to go green, and ways to shed some extra weight (I am 35 lbs overweight) and thought that riding a bike 18 miles round trip to work each day might help with that. Neat Idea, but there were some problems. Problem One: I’m 53 years old, I haven’t ridden a bike in a meaningful way in over 30 years and I’m out of shape. Problem Two: I live and work in the Seattle area (which is actually two problems). The ground isn’t flat here. There are hills and long grades everywhere. It rains here a lot. So my gear will be getting wet and I can’t get up the hills because I’m too old and out of shape. I guess that idea is gone. But I didn’t let it go. I kept thinking about it. I finally caught onto the idea of bikes that provide electric assist when you need it. I began to do research. I wasn’t looking for the cheapest thing I could find. I was looking for the best quality thing. I recently spent some time in Amsterdam and became interested in their traditional commuter bicycles. People there don’t put on racing gear and hunch over the handlebars. They ride sitting upright. The bikes have full fenders to keep the rain off and chain guards. People wear whatever they are wearing to work. Riding a bike isn’t some sort of enthusiast passion, it is simply getting back and forth to work, or wherever. So who makes the best traditional commuter bicycle that provides electric assist? After all of my research, the winner was the Pedego Classic City Commuter. The bike got compared to many others and came out on top in every area. The company also got high marks for customer care and responsiveness. So I bought the bike. I bought the 48v version because I’m a big guy and I wanted to make sure it could handle my weight and the hills. I also mounted a storm case to the rear rack to keep my gear dry. By the time I had the bike three days I had experience on two fronts: The bike itself; and the Pedego Company. The Bike: The Pedego Classic City Commuter is beautiful. It is incredible quality with obvious attention to detail. I can get back and forth to work and up and down the hills with plenty of power. I am going 17-20 miles an hour up the hills and going 30 coasting down the other side. My 25 minute commute by car takes 32 minutes on the bike. I couldn’t be more pleased. Pedego the Company: Prior to making my purchase I wrote Pedego with some questions about the rear carrier rack. I wanted to get some details to assist me with selecting a rear carrier. That same day I got back details that included photos, dimensions, etc. The speed and thoroughness of the response, to someone who wasn’t actually a customer yet, totally exceeded my expectations. The next interaction I had with them was also outstanding. The seat on the City Commuter was too hard to suit me. So I wrote Pedego and asked them if the mount was a standard size so I could order a more comfortable seat. They called me back on the phone again the same day, within a few hours. They guy I talked to said that he thought the seat on the City Cruiser was a more comfortable seat and offered to ship one to me, and I hadn’t even asked! I was prepared to go find a seat on my own that I like better. I can’t remember the last time I had this sort of experience with a company. Totally amazing! Best purchase I've made in years! I just surpassed 1,000 miles on my City Commuter, yesterday. That’s 1,000 miles that I emitted 10% of the CO2 that I would have if I had driven the 21 miles to my job. Plus, I got exercise and got to smell the Jasmine and Honeysuckle that has been blooming in the South Carolina Lowcountry. Best purchase I’ve made in years! I forgot to mention: that’s 1,000 miles just since mid-February of this year! I just purchased a brand new Pedego City Commuter today. I brought it home and rode it for about 45 minutes around the neighborhood. This is a great bike! I am so pleased and very happy with my purchase. The bike is black and has the “classic” look. I love having fenders and the 5 speed pedal assist is incredible. I rode several electric bikes without the pedal assistant (PAS) and didn’t care for them. This bike is very well made and very smooth when you do pedal. I upgraded to the 15 amp battery vs the 10 amp battery for longer battery life and ride times. I also love the monitor that gives you all the information at a glance: speed, battery life, etc. etc. The bike is very well designed and the construction seems to be excellent. The 28 inch tires are terrific. I like being up a little higher anyway. I talked to Don, one of the owners just after I purchased the bike. He has always answered the phone, even on a Sunday night a few weeks before I made my purchase. I believe Pedego is a top notch company that really wants to make the customer happy and they go out of their way to make that happen. I have recieved excellent customer service so far from Don and Pedego. If you are in the market for an electric bicycle, I would strongly recommend the Pedego City Commuter. I look forward to many hours and miles over the next few years. Thank you Don and Pedego Electric Bicycles for making my buying experience and the bike itself an outstanding product! I was diagnosed with Cancer late last year. Following months of chemo and other treatments, I was wanting to rebuild my muscle strength and get out on the road again with my young daughter and son (both avid bike riders). After doing my research, I heard about and tested a Pedego. I feel in love with the bike’s design, construction quality, features, and outstanding brand service reputation. 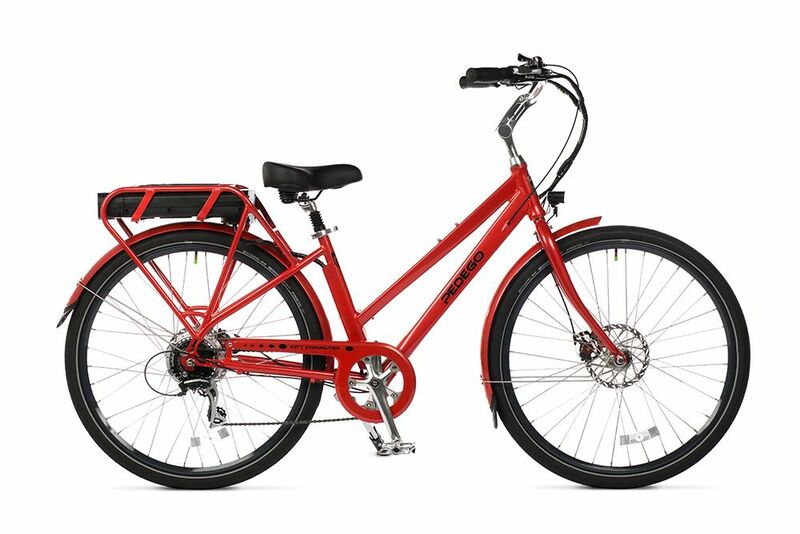 I purchased a 28″ Classis City Commuter from Pedego of Denver. The dealer was fantastic over the phone helping me pick out the perfect model and size (I’m 6’6″). I LOVE my Pedego, as does my kids. It has helped me get back onto a bike and outside to rebuild my strength. My Cancer doctor and team have been blown away by how effective this bike riding is for me. They’ve heard nothing but rave reviews about my Pedego. I’m planning to enter the upcoming Obliteride biking fund raiser to support Cancer research. I wouldn’t have ever thought that would be possible without my Pedego. Pedego’s Customer Service team helped me by replacing the kickstand with the double sided design. They clearly want their buyers to love their products. I’m sold and recommend my Pedego to other Cancer patients and friends. I have had my PEDEGO CITY COMMUTER for 2 years, after 1400 miles it still is going strong. Perfect bike for senior bike rider, I will be 77 in June and hope to be ride it for a lot more years. I just purchased a city commuter step thru. I own five electric bikes of different brands. The Pedego is without doubt the very best. I will put my wife on one now. After renting some Pedegos my wife and I decided that ebikes were part of our future. That turned out to be a great decision but not without some missteps. My wife found another brand on sale from a chain bike shop and bought a pair of them. It quickly became obvious we had gotten what we paid for. On the second ride, my motor failed while trying to climb a hill 5 miles from home. I took it to the shop where it was purchased and they said they could order a replacement motor to repair it or refund my money. Easy decision for me. I took the refund and bought a Pedego City Commuter from the local Pedego store. While it cost a little more, it has been trouble free but I wish I could say the same for my wife’s bike. Lots of small problems compounded by terrible dealer support. The local Pedego dealer has been more help for an ebike he didn’t sell than the place it was purchased. My wife now wishes she had a Pedego. Anyone want to buy a used brand x? My wife is getting a Pedego for her birthday. Amazing bike. Got me out riding again. What an incredible machine. The design and manufacturing quality are over the top. It took less than ten minutes to unbox it and set it up. Even my daughters were zipping around on it as soon as we got it. Service was great. Delivery was perfect. And the bike is truly awesome. People stop me to ask about it, so expect a few more orders from Santa Barbara! I really never imagined that an electric bike could be this high quality and this much fun. Our Pedego is an absolute home run. Thanks! Love my new Pedego City Commuter 48V 10Amp bike. So happy that I’m thinking of buying a second one. The performance is great, and after having used the throttle now, would not consider a bike that didn’t have both throttle and assist modes. Finish is beautiful and the display is great and easy to read day or night. My only complaint is that the built in lights are not bright enough and don’t have a strobe feature. Solved this by adding a USB recharge headlight (which can be recharged by the USB jack on the display). Overall very happy, and with my recent total knee replacement, I’m now able to ride again with the assist taking some pressure off the knees. Great Product. I am a 68 year old retired High School Health and Physical Education teacher. I spend the the winters in South Florida, summers at the Jersey Shore and still work as a Real Estate Broker and live in the Philadelphia area when I am not at my beach homes. I love the beaches were I live and ride my bikes every morning for 15 to 25 miles. i ride the board walks and around town for hours and in Pennsylvania many steep hills. I took delivery of my white step thru, Pedego City Commuter on the 4th. of July, 2013 and now, less than six month later have accumulated almost 2000 miles. That says a lot about how much I like this bicycle and still able to ride at age 80 with a past of two broken hips and a hip replacement. The stability, comfort and quality of the the City Commuter is unmatched by any bike of the many I have owned thru-out the years. Battery depletion anxiety is of no concern as the structure, frame geometry and the seven speed Shimano cassette allow me to peddle with no power at 12- 14 mph on level surfaces in light to moderate head wind. Rides of 60 miles plus on a single charge are not uncommon with enough power reserve to boost me home up a mile long hill with six to ten percent rises. If anything ever fails on the bike, I have every reason to believe I will receive excellent support based upon my Pedego experience thus far. I purchased my City Commuter from Pedego Carlsbad last September. My intention was to use it to ride around beach areas. I did so for a month or so, then returned to our place in the desert in mid October. I had so much fun on the bike, I started to use it instead of my car for many errands, such as groceries, post office, etc. Then I found myself riding it to a volunteer job I do two times a week. Now after 5 months, I find I have reduced my gasoline usage by 75%, reduced my bad cholesterol by 10 points, and raised my fun quotient immeasurably. The Pedego bike, is solid, comfortable, and plenty powerful. I hope many more folks decide to enjoy this as I do, and I appreciate the excellent service you provided me in the beginning. See you in June when I return to the beach. I have had a Pedego City Commuter for nearly a year and absolutely love it. Recently had a problem with the LED readout and Travis from tech support was exceptional in helping me resolve it. Quick response to my emails and very knowledgeable. Thanks so much! I can’t tell you how pleased I was to hear from Pedego.I just bought the city commuter two weeks ago and have only been on it for just a mile or so But after I bought it and read other reviews I knew I made the right decision. This is going to give me so much pleasure; I’ turning 70 in a couple of weeks and my wife wants me to stay active but it’s hard with copd thus the electic bike. Now we can ride together. We are not far from Rehoboth Beach Delaware and would love riding in the beach area and so now I can! Wendy thanks for your response and since there is no Pedego dealer near us I hope that I can contact you all should I need anything for my city commuter in the future or better yet open a dealer in lower slower Delaware !! A couple days ago, we took delivery on 2 Pedego City Commuters after a really great buying experience with Metropolis in North Hollywood. I hooked up the Trail-a-bike we’d gotten to go with it and went and picked up 4.5 year-old son at preschool. He rides a no-training-wheels 12 inch, so it only took a minute for him to get comfortable on the Trail-a-bike. Soon we were cruising home. I asked him if it felt ok. “This feels wonderful!” he shouted back. My wife got home and we took a family cruise around the neighborhood. We couldn’t get the smiles off our faces. We were talking about it all night. Yesterday I disregarded the advice of the manual (please let me know if this is a truly bad idea) and hooked up 2-year old son’s front-attaching bike seat to the stem. It fit much better than it did on my Bianchi Broadway, and because the bike is so heavy and sturdy, the balance was so much easier. We cruised down to the Rose Bowl and played at the children’s museum. I couldn’t believe I had us back home in 25 minutes, that I didn’t have to change clothes from sweating through them. Yesterday afternoon, when my 5-year-old came home from school and I got back from yoga, he was sitting on the front steps waiting. “Can we go for a bike ride?” “Absolutely.” I hooked up the Trail-a-bike, with my other son in the front seat and started off. I worried that I was really going to test the limits of the 500 watt motor, that with two kids the balance would be really compromised, but nothing doing. We cruised around the neighborhood for a half-hour and that thing never faltered. There’s no preschool today, so we’re going to pedal on down to Pirate Park to meet some friends. I can’t wait to see their faces as we roll up. Though it hurt me to lose the lake house, these bikes have already given me so much joy. They’re just the kind of thing my grandparents (early adopters of both the snowmobile and scooter) would have loved. For me it makes this town where I’m raising my kids a little more like the one I grew up in. But most importantly, it makes possible a thing I’ve always loved – a leisurely bike ride with people you love around the neighborhood. Thank you so much for this. I’m so excited to be a Pedego owner. I look forward to many years on your product and am glad to know you’re not far away. You have my most enthusiastic support. At age 15 I worked for a company that manufactured pistons for Honda motorcycles. I thought it’d be great to ride a motorcycle that I made pistons for. I rode Hondas until I was 66 years old. One day after a ride I tried to get off and the pain was so severe I knew my motorcycle days were over. I’d riden through 22 states up and down the east coast and out to Wyoming. The thought of that ending literally depressed me. I loved bike riding and reluctantly started planning bicycle tours. It wasn’t the same and I have 3 different bikes, one for touring, a hybrid, and an urban bike. As a kid I put a lawnmower engine on my bike and thought maybe I’d get a kit and do that to one of my bikes. After doing a lot of research I determined an electric bike would be great to ride around the many great parks in my area. I purchased a Pedego City Commuter Classic over Amazon having never actually ridden one. It was a very expensive gamble on a retirees income and the nearest Pedego dealer is over a 4 hour drive away. Turns out that after doing some repairs on the faulty wiring harness and error 3 controller problems Pedigo’s great tech support had me doing repairs and up and running quickly. Even that was fun. I’m having a great time. I put over 100 miles a month on it riding along the shoreline of Lake Erie and our a great park systems. Not bad for being 69 and now that I know what I’m doing I think I’ll easily double that mileage next year. I stop and watch the eagles fish, or have a picnic. I ride it to fish, or stop to read a book in the shade. Temperatures up north are ending the riding season but thanks to Pedego not my riding adventures and I’ve got the pictures of them to enjoy during our cold winters months, just like my motorcycle days. If you look at the Pedego owners club site on Facebook you can enjoy the photos of my rides too. I gave my sister my only car and my City Commuter Pedego is my only driver. My cargo trailer is my Costco pickup. I save tons of money going green riding my Pedego … No auto insurance, no gas and no driving car liability. Not surprising city cops ignore me on my travels. However, 30 plus years of clean car traffic record. Don of Pedego USA is aware of my history.. I missed riding my bike but because of some issues of asthma when exercising I just couldn’t ride long distances like I used to. Because of the pedal assist feature I now can go for hours. I am so grateful I found this company. Customer service is great and they treat you like you are one of the family. They have so many different models and features that no matter what you are looking for you can find. I’m now able to once again enjoy the outdoors while getting the exercise thanks to my pedego! I bought my Pedego City Commuter in March of 2014, and I’m just a few miles away from having 5,700 miles on it. Most or my rides are around 25 miles round trip. I’ve had a few problems with it, but Pedego Irvine has fixed them under warranty, and taken very good care of me. I’m turning 79 years old in March, and my Pedego keeps me active. I hope to ride many more miles on it. I ride my Pedego everyday in the summer. It is very comfortable and easy to ride on my trips to do errands. Also have rode 200 miles on the Katy Trail in Missouri. It is a very versatile bike. I would recommend a Pedego e-bike to anyone interested in purchasing a e-bike So much fun riding my Pedego! “I am 69 years old and I have Chronic Obstructive Pulmonary Disease (COPD). As the years have gone by, I have been able to do less and less physically. I no longer have the breath to ride a conventional bicycle. I used to be able to do about everything. Meanwhile, bike paths have been sprouting up everywhere and in the greatest places! I had to watch and wish that I could go to those places, but it was not to be. Then, I found Pedego. In what seems like a miracle, I can now ride anywhere I want! I bought a bike rack so that I really can go and bike anywhere, especially in the mountains. With my Pedego, I don’t have to pedal if I don’t want [can’t]. But, I pedal as much as I can just for the cardio vascular benefits. My pedego bike is a huge time saver! I can now commute to places I couldn’t before because of the many hills I would have to climb. It’s super easy to use and the battery lasts a long time! Buying a Pedego, reopened my world! “With Arthritis in my knees, long distance road biking was getting more and more challenging, making it even more difficult to keep up with my husband! Per my husband, buying my Pedego, opened up my world! When I turned 60, I decided to get back into bicycling, which I had enjoyed so much as a kid, and years later, again with my son when he got old enough to ride. I bought a used road bike, built up to it again. My area is hilly, and to ride any distance, you have to WORK. After a couple years, my knees and hip were telling me this was not going to be something I can do long term, and my wife was not really willing to work that hard either. I had heard about ebikes, so I started researching on-line. I learned a lot,and the name Pedego kept coming up as quality ebikes. Wondering if there were any dealers close, to my surprise there was a dealer no more than twenty miles or so. I stopped in there to talk, Archie handed me a helmet and said “Lets go!” After a shake-down cruise on the parking lot, off we went on the trails that run right by his shop. I was love at first ride! The Pedego has removed all the hills in my town! I would not be riding anymore without ebikes. They have allowed me to continue the fun. My wife also has a City Commuter, and I have two other ebikes as well as my City Commuter. I sold three motorcycles to buy ebikes! Thanks for the fun. I got my Pedego electric bike on June 12, 2015 and absolutely love it. I’ve always loved biking, but developed osteoarthritis in both knees. I didn’t want to give up biking, so buying an electric bike proved to be one of the best decisions I’ve ever made. It allows me to continue doing what I love without stressing my knees. I can ride further, I can tackle hills, strong winds don’t stop me and I can keep up with stronger riders. I have a bike club & was responsible for 5 other people also purchasing electric bikes, 4 of which were Pedego bikes. I have over 3882 miles on my Pedego. I live in NY State, so riding is weather dependent & generally only able to ride from April to October. We’ve taken trips with our bikes which I never would have been able to do without an electric bike. I would love it if Pedego could make a less heavy bike & maybe put the motor in the middle. I use a pet ramp to get my bike into our van. Keep up the good work Pedego! I love that it is made in USA & Customer Service is awesome. Thank you! Wow! What fun and power! I transitioned from a motorcycle to the Pedgeo to not only gain the health benefits, but to also explore the forest preserves, trails, and plan to take it on extra long rides that I wouldn’t be able to do on a pedal bike. The throttle feature is awesome especially transitioning from a motorcycle. The dealer was awesome, they educated me and reviewed the features, functions, etc… The only problem now is waiting for the snow to melt so I can get back on it! I’m 72 years old. I haven’t ridden a bike in 50? years! I moved in a 4500 acre community two years ago. This community has multiple walkways, nature and bike trails, parks, and a lake. With my bike I can explore several miles of this yet-uncharted development. (See things not many folks have seen yet!) I can go faster, further and able to experience so much more! I just love my PEDEGO! My Pedego’s name is Hope and she is helping me rebuild my life by rebuilding my body. I bought Hope right before my gastric sleeve surgery and she supports me with PAS and her throttle to build muscles in my legs and hips making me feel terrific and giving me energy to be more active. My favorite characteristic of Hope is her battery life, her power, and her ease of use. She is consistent, easy to learn, and she builds my confidence everyday. Yesterday I stopped into my Pedego Dealer in Glendale AZ and Steve hooked Hope and I up with a bike rack so Hope and I can go exploring! The bike is fabulous and my dealer is an Angel ðŸ˜‡. “We bought our PEDEGOS three years ago. We had not been biking for years as the hills getting back to our home Are steep. Since we purchased our bikes we are biking all of the time. We throw them on the back of our car and take them with us on vacation. What A Way To Ride!! I first rode an electric bike while on vacation and new right away I had to have one. I found a Pedego dealer in my area and bought one fast! This bike rides great, is easy to use, and quite a looker!! People stop me all the time to ask what it is. I love this bike and won’t ride without it!! Living in Scottsdale Arizona I’m able to ride pretty much every day. And for me being disabled it’s a real lifesaver. I have a reason to get out and go now and with my Pedego I can. One of the best purchases I’ve ever made. I really like being able to tailor my ride depending on the terrain and conditions. There is a gearing and pedal assist combination for all of them. Living on the island of Oahu is an amazing experience. Riding a 28″ Pedego Classic City Commuter everyday makes it even better. I live in the Makiki section of Honolulu but my office is about five miles away on top of a 500-foot extinct volcanic mountain that overlooks the city. According to Google Maps, a regular bike would take approximately 40 minutes and lots of perspiration climbing up there. However, with the peddle assist on my Pedego, the commute to work is an easy no sweat 15 minutes during which I can enjoy the cool Hawaiian breeze and beautiful views. There is no doubt that my Pedego has enriched my daily life. Mahalo and aloha Pedego! We absolutely love our City Commuter bikes. 5 level assist is great for hills and so is the throttle – Solid construction! “What am I supposed to say? I love the F-ing thing! All the joy of riding a bike, without the worry of climbing that menacing hills back to my house. “I would like to share that I love my Pedego because I had a knee replacement and was unable to ride my regular bike,so we went on vacation and rented a Pedego bike and to my surprise I was able to get my life back by being able to ride a bike again. I came home from my vacation and purchased my bike immediately. 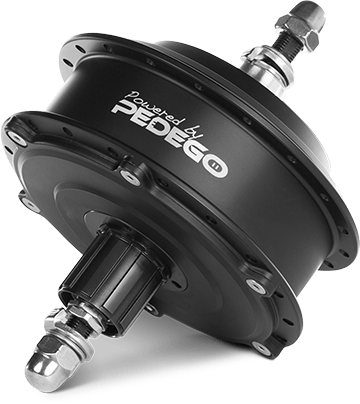 THANK YOU PEDECO for your product. I have absolutely no regrets about buying my beautiful City Commuter to use as a secondary €œvehicle” when I travel in my Class B (van) RV and to go on errands around town when I am home. To retain the exercise benefit of bicycling, I use pedal assist mostly when I am starting from a stop or going up hills. Wow! This bike is awesome! Having moved to a very hilly community in Rancho Mission Viejo I wanted to explore the neighborhood and surroundings on my bike. The problem is that the hills are extremely challenging and by the time I peddled a few blocks I was ready to do a U-turn and head back home. No fun. I decided to do some research and invest in an electric bike. Having tested several bikes, the decision was easy. Pedego gave me peddle assist and throttle assist as well as a powerful motor and an plenty of battery power to go anywhere I want. I’m have a great time on my Pedego. It’s powerful, comfortable and affordable. I’m riding more now than I ever rode in the past. My wife wasn’t interested in an electric bike but after listening to me about my riding experiences we’re going to our local Pedego dealer to pick out a bike for her. City Commuter get her anywhere she wants to go! I purchased the City Commuter for my wife as a birthday gift. She is 60 years old and with her old bike was not able to tackle some of the more demanding hills in the more scenic areas of our city. Since she starting riding the City Commuter there is no limit to where she can ride. Great bike! Lot’s of fun! Endless possibilities! My Pedego City Commuter has set me free to live life a little fuller. I have Social Anxiety Disorder (a fear of people—which keeps me mostly housebound) and going out on my Pedego helps me to feel more free. Leaving my home on my Pedego doesn’t feel so threatening as it does if I just walk out my door to do something. (it’s not as easy for someone to stop me if I feel uncomfortable) As you can imagine, I don’t get much exercise being locked away in the walls of my home, so I really enjoy going out riding with my husband (who also has a Pedego City Commuter) It has really changed my life from never leaving my home to going out and enjoying my life a lot more often. Thanks Pedego Family for all you have done for me and the ways you have changed my life. Love my City Commuter! She reminds me of my first “real” bike but with an added Superpower – electric assist!! I can plan a long ride for pleasure or to pick up groceries and know I can easily make it back home. Living at the top of a high hill, this just wasn’t possible with other bikes. Love the electric assist! I really love my Pedigo. I have used it for work, for exercise and for just plain going on a ride that would be a lot harder to accomplish without my Pedigo. This is the best bike I have ever owned. To think I almost bought a different brand of ebike before choosing a Pedigo. Good thing I didn’t. The customer service received from day 1 is the best. My wife and I purchased from Sean in San Diego and we continue to receive the best customer service ever. I refer to my City Commuter as my 1 and done. 1 ride and it was a done deal. Thanks Pedigo.